The Orioles have long been tormented by the Blue Jays, especially at Toronto’s Rogers Centre. But things may have turned last week, when the O’s took two of three from the Jays in a critical series for both clubs. 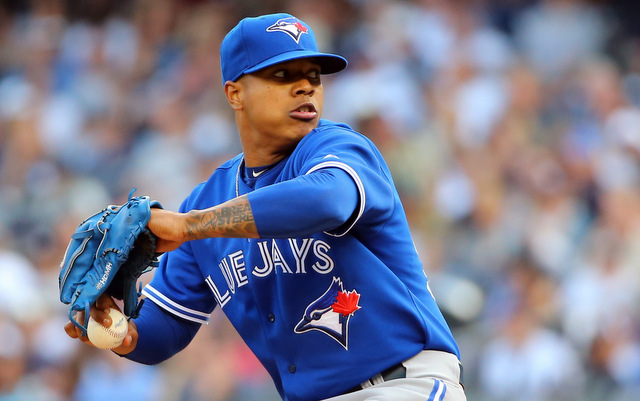 Toronto earned homefield advantage by winning the season series, 10-9, but tonight’s starter, Marcus Stroman, has struggled to a 7.04 ERA in four starts this year against Baltimore. Chris Tillman has not traditionally fared all that well against Toronto, but he was Baltimore’s ace for most of the year. The Orioles were a bad road team for much of 2016, padding their record with dominance at Camden Yards. But they finished 2016 on a road surge, winning their final five series. Four of those were against playoff contenders or teams with winning marks, leading you to believe they can go up to Toronto and win. The big disparity with these two clubs lies in the relief corps. The Orioles’ back-end is almost lights out, even as Brad Brach has slumped a bit in the second half. Zach Britton is a perfect 47-for-47 in save opportunities, and could be called on for a multiple-inning save if need be. The O’s led the Major Leagues with 253 home runs, even if they were overly dependent on them. At any given moment they can go deep. Mark Trumbo led baseball with 47 bombs, and has been heating up of late. Manny Machado, Adam Jones, Chris Davis, Jonathan Schoop, and Pedro Alvarez all topped the 20-homer mark. For whatever reason, in eight Wild Card games under the current format, the road teams are 6-2, with only the never-say-die Royals in 2014 and Pirates in 2013 being the exceptions. Perhaps it’s the lofty expectations and pressure of being at home, or the opportunity to bat first and get an early lead. Whatever the case, the home team winning is anything but a sure thing in these one-game pressure cookers. One thing that has helped the Orioles’ oft-beleaguered pitching staff this year is the team’s stellar defense. Baltimore features several Gold Glove candidates in Machado, Davis, Jones, Schoop, and J.J. Hardy. The O’s don’t make too many unforced errors, and they are suddenly a more battle-tested team after slumping through July and August. A strong September finish represented successful bookends to 2016 after the O’s were the last unbeaten team at 7-0. They cruised atop the AL East for much of the first half, but had to scrap and claw at the end just to get a road game in the Wild Card round. That could actually serve them well in this spot. The Jays went on a tear to end 2015 and were picked by many to win the pennant, but fell short against the scrappy Royals. This year, they, like the Orioles, had to struggle and grind in September to get in and fend off the Detroit Tigers and Seattle Mariners. After coming up short, there is a sense of unfinished business for a team whose championship window might be closing. The Jays’ rotation is, somewhat surprisingly, now one of the best in baseball. That doesn’t often help in a one-game playoff, but the team has a couple of extra rested starters it can use as relievers if needed. That includes left Francisco Liriano, who dominated the Orioles with 10 strikeouts while not allowing a run last week, and perhaps even Marco Estrada, who might have been the club’s best starter during last year’s playoff run. Closer Roberto Osuna, as good as he’s been, is leaking some oil due to overuse, so the extra assets will be a big help for manager John Gibbons. The Orioles may have led the Majors in home runs, but the Jays’ offense isn’t exactly anemic. Toronto finished fourth in the bigs with 221 long balls, and can also go deep from various spots in the lineup. It is imperative for Tillman to keep the ball down, because Josh Donaldson, Edwin Encarnacion, Troy Tulowitzki, Russell Martin, Michael Saunders, and Jose Bautista all hit at least 20 homers too. The Jays are more than capable of keeping up with Baltimore in a potential slugfest. The league hasn’t seen a team steal as few bases as the Orioles in over four decades, as Baltimore finished with a paltry 19. The Jays ranked just 25th in baseball but still had 54. Kevin Pillar led the team with 14, just five fewer than the entire Orioles team. So if the Jays can keep Baltimore in the yard, that goes a long way toward victory. No, Stroman has not any much success at all against the Orioles this year. But he has posted pretty good numbers overall down the stretch, and has a penchant for getting himself fired up for the biggest of games. He actually pitched well through six innings last Wednesday before faltering in the seventh, and if he can be strong through six again, Toronto’s chances increase drastically. This is such a tough call, a game that figures to be heart-stopping until the very last out. It seems like TV and the league as a whole would love to see a Toronto-Texas rematch, and the Orioles’ poor history at Rogers Centre worries me. If Baltimore has a late lead it is in very good hands, but Tillman has not been the same pitcher since the injury bug bit him in August. Even though Toronto’s bullpen is up-and-down, I expect Stroman to be a tad bit better than Tillman, and ultimately the Jays will find a way. Blue Jays, 5-4. You know what everyone is thinking – it’s an even-numbered year, and the Giants found a way to get in, and so now they’ll probably win it all. Not bad thinking, but flawed nonetheless. The Mets are the defending NL champs and closed with a 27-13 run to get here. They are battered by injuries, but have their one stud still standing on the hill in Noah Syndergaard. He could match the unflappable Madison Bumgarner zero-for-zero, making for a potential classic here. San Francisco’s bullpen is a major question mark as well, as it had the most blown saves in the baseball with 30 and still does not feature a true closer at this point. Yeah, I’m still throwing that stat out there. More so, it’s the fact that this franchise has won nine straight postseason series and one wild card game, so it is extremely dangerous in October. The Giants were in this exact same spot two years ago, on the road in Pittsburgh with Bumgarner on the hill. They won, 8-0, and went on to win their third World Series in five years. He has emerged as perhaps this generation’s best postseason pitcher, having already secured three World Series titles at just 27 years of age. His heroics in the 2014 postseason could be intimidating for any lineup, including the Mets and their home run-dependent offense. This is the last team that would get flustered on a big stage, and now the Giants have essentially been playing playoff games for about a week now. When they needed to, despite a dismal second half, the Giants found a way to win their last four to hold off the equally-hot St. Louis Cardinals. The Giants have baseball’s best manager in Bruce Bochy, even though he faces some stiff competition from his counterpart. Like with the AL wild card game, there is a big disparity in the running games of these two teams. The Mets were 28th in baseball with 42, while the Giants were 14th with 79 and led by former Met Angel Pagan with 15. The trade-deadline acquisition of Eduardo Nunez has helped in that department as well, even though Nunez is nursing a hamstring injury. This was baseball’s best club at the All-Star break, with a 57-33 record. But something changed in the second half — or for most of it, anyway — that turned the Giants into a much more flawed team. But, channeling their inner-2010, 2012, and 2014, they got it going just in time to catch themselves, and may have returned to their first-half form. If you do believe that you need to get to October carrying some momentum, then the Mets might be an appealing pick. New York finished 27-13, once again buoyed by a healthy Yoenis Cespedes, after floundering at 60-62 in late August. Despite losing three of its four young studs in their rotation and key lineup pieces like Neil Walker and David Wright, the Mets have found a way to pick up steam heading into this showdown. Bumgarner is about as good as it gets in October, but he may have met his match in Syndergaard. ‘Thor’ is a Cy Young contender, finishing 14-9 with a 2.60 ERA and carrying the rotation on his back. He was also very good in last year’s World Series run, and for any offensive shortcomings the Mets may face against Bumgarner, Syndergaard could prove to be the ultimate equalizer. Though the Giants have been this decade’s October gold standard, the Mets have some experience fresh in their minds after their World Series run in 2015. Despite finishing with the fewest wins of the five playoff teams in last year’s field, the Mets edged the Dodgers in five games in the NLDS before sweeping the white-hot Cubs, so they won’t be intimidated by this stage, either. It would be a crying shame if Collins didn’t win NL Manager of the Year honors. He was deserving last year as well, but it should be a slam dunk this year. The Mets have lost a bevy of star players, plugging in veteran cast-offs and untested rookies and still overtaking the Cardinals and Giants for the top wild card spot. Collins is deft at using both his bench and bullpen, with the latter being a significant advantage for the Amazins. All of those blown saves are cause for concern with the Giants, and on the flip side, the Mets own the league’s best closer in terms of total saves in Jeurys Familia (51). Familia did suffer three blown saves in last year’s World Series, but two of those were extremely tough saves when he entered with a runner in scoring position. Collins can bridge the gap to Familia with the likes of Addison Reed, Jerry Blevins, and Hansel Robles. The Giants’ bullpen may ultimately be more experienced, but New York’s has been far more trustworthy in 2016. Sentimentally, the Mets would be the pick, but logically, the Giants in October are too tough to bet against, even in a one-game toss-up. Bumgarner should be able to pitch ever-so-slightly-better than Syndergaard, and the bullpen will ultimately shut the door, be it with Sergio Romo, Santiago Casilla, or even Hunter Strickland or Javier Lopez. It should be a great game, but the Mets’ terrific run ends at Citi Field. Prediction: Giants, 4-3. Be the first to comment on "MLB Wild Card Games Preview & Predictions"